Chocolate is a food prepared from ground roasted cacao beans, the seed of the tropical theobroma cacao tree. Most of the chocolate in the world has its roots in Africa, which generates about 70% of the world’s cacao beans. Other top cacao-growing countries include Indonesia, Brazil, Ecuador, Togo, Mexico and Papua New Guinea. Chocolate is one of the most popular flavors in the world, and in Germany there is no exception. Chocolate is so loved in Germany that it is engrained into the culture. Children grow up enjoying it more than any other candy. Chocolate is also part of many traditions and celebrations. In fact, Germany is second in the world (just slightly behind Switzerland) when it comes to the highest annual chocolate consumption. German chocolate ranks with Swiss and Belgian chocolate as the finest in the world. Here, on our chocolate page, we define the different types of German chocolate. We also provide some valuable information on chocolate and chocolate production. We also identify some of the German brands of German Chocolate Bars (Tafelschokolade) and German Filled Chocolates (Pralinen) available here in the U.S. And for all those bakers who love chocolate, we list several popular recipes which use chocolate as an ingredient. German chocolate is categorized into the following four types. Dark chocolate is the darkest chocolate. Of all the types of chocolate, it contains the most cocoa solids. It is also the least sweet of all the chocolate types, and tastes the most like pure cocoa. There are two types of dark chocolate. The difference between the two kinds lies in the amount of cocoa solids contained in the chocolate. The more cocoa solids, the more bitter the chocolate is. Dark chocolate is made from 60% cocoa solids. Semi-sweet chocolate is made from 50% cocoa solids. Milk chocolate is lighter in color than dark chocolate because it contains more milk powder (a minimum of 20%). It is also sweeter and contains less cocoa solids than dark chocolate. Milk chocolate is enjoyed as is and not used very often for baking. There are three kinds of milk chocolate. The differences between the three kinds is based on the amount of milk fat contained in the chocolate. The more milk fat, the creamier the chocolate tastes. Milk chocolate contains 3.5% milk fat. Whole milk chocolate contains 4.5% milk fat. Cream chocolate contains 5.5% milk fat. Alpenmilchschokolade is a unique milk chocolate, in which the milk contained in the chocolate comes from farms in and around the Alps region. White chocolate is an off-white chocolate. It is made without cocoa solids, which is what gives chocolate its brown color. It contains more cocoa butter and milk powder than brown chocolate. 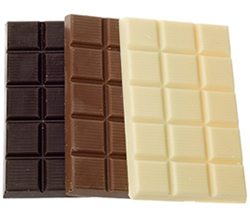 Unlike brown chocolate varieties, white chocolate is not bitter and is sweeter. Kuvertüre is a chocolate that is used primarily in baking and in the production of chocolates candies (such as filled chocolates). 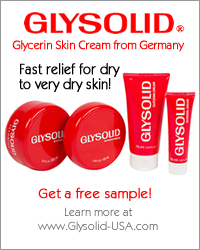 It is available in solid form. It is then heated to liquid form to cover cakes and other baked goods (such as cookies). 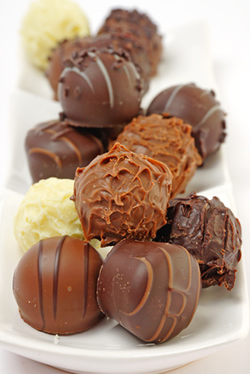 It is also used to form into chocolates candies, as well as covering fruits (such as chocolate covered strawberries). Like the other types of chocolate, Kuvertüre contains cocoa solids, cocoa butter (a minimun of 32%), and sugar. The difference is it has a higher fat content, helping it to melt smoothly and dry with a glossiness. Kuvertüre is thinner when melted and is thus capable of creating thin shells around a cake, cookie, or confection. Chocolate bars, either plain chocolate or containing additional ingredients, are very popular in Germany. 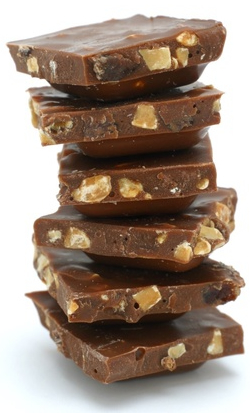 The most popular kind is chocolate with nuts (Nuss-Schokolade), which contains either whole or chopped hazelnuts. There are hundreds of other varieties of chocolate bars - chocolate with strawberries, yoghurt, peppermint, nougat, marzipan, coffee, and many other combinations. Some well-known German chocolate bar brands available in the U.S. are listed below. Ritter Sport is a very popular German chocolate brand and produced by the Alfred Ritter Company. The company was founded in 1912 in Stuttgart. The famous Ritter Sport chocolate square was first created in 1932. Today, they offer 40 delicious varieties of chocolate (in a variety of sizes), such as chocolate with whole hazelnuts, chocolate with marzipan, milk chocolate, Alpenmilchschokolade, dark chocolate, etc. The origins of Milka chocolate date back to 1825, when the confectioner Philippe Suchard opened a candy store in Switzerland. The name "Milka" didn't come about until 1901. It was derived by combining the German words "Milch" (milk) and "Kakao" (cocoa). Today, Milka chocolate is produced in many countries. The chocolate bars (Tafelschokolade) are produced primarily in Germany and Austria. Milka chocolate comes in a variety of different combinations. The Alpenmilchschokolade is the most popular variety. Other varieties include chocolate with hazelnuts, chocolate with strawberry filling, chocolate with yoghurt filling, etc. All Milka chocolate bars a packaged with the traditional purple packaging and the purple-cow logo. Sarotti is a tradition-rich German chocolate brand. Its origins date back to 1852, when Heinrich Ludwig Neumann opened a candy store (Confiseur-Waaren-Handlung Felix & Sarotti) in Berlin. The store was taken over in 1881 by Hugo Hoffmann, who changed the name of the store to "Sarotti." Over the next 50 years, the company grew and expanded quickly. In 1918, Sarotti added the genie to its logo - the design that remains today. Today, Sarotti chocolate is known for it high quality chocolate and ingredients. Its chocolate bars are made for the sophisticated chocolate connoisseur. Products include milk chocolate, dark semi-sweet chocolate, chocolate with whole hazelnuts, chocolate with nougat, and many more. Alpia chocolate, from the Stollwerck company, is very popular with children. Its chocolate bars include milk chocolate, white chocolate, chocolate with chopped hazelnuts, chocolate filled with strawberries and yoghurt, chocolate with raisins and nuts, and many more. Kinder chocolate is made by Ferrero Deutschland. The Kinder products are designed specifically for children. They are made with a large quantity of milk, giving the chocolate a milder, more milky flavor. Also, Kinder chocolate comes in smaller sizes than the standard chocolate bar size. Filled chocolates are bite-sized chocolate candies, made with a minimum of 25% chocolate, as well as assorted fillings, such as nougat, marzipan, liquor, and pistachios. Some well-known German filled chocolates available in the U.S. are listed below. Halloren is Germany's oldest chocolate factory. It was founded in 1804 by Friedrich August Miethe in Halle. The company originally sold its chocolates under the brand name "Mignon," a brand which they still hold today. Their signature "Halloren Kugel" (chocolate globes) were first introduced in 1950, along with various other candies. Today, the main product is the original Hallorenkugel chocolate globe, made from chocolate, cream, and additional flavors (such as Irish Cream, Strawberry-Mint, Black Forest Kirschwasser, Berries & Yoghurt, etc.). Additional specialties include the filled chocolates (Pralinen), chocolate bars, marzipan specialities, as well as chocolate covered jellies, rum balls and coconut flakes. The Asbach Company was founded in 1892 by Hugo Asbach in Rüdesheim (in the German state of Rhineland-Palatinate). The company quickly became famous for its brandy (Weinbrand) "Asbach Uralt." Asbach chocolates were introduced in 1924. These were chocolates filled with the Asbach Uralt brandy. Today, the company produces a variety of chocolates. The most well-known product is the miniature bottle-shaped chocolate filled with Asbach Uralt brandy. Other products include the Asbach Cherries, Asbach Beans (bean shaped chocolates), boxes of assorted Asbach Chocolates, and Asbach Truffles. Chocolate is derived from the seeds of the tropical theobroma cacao tree. These seeds have a very bitter taste and must be fermented to develop its flavor. After fermentation, the beans are dried, cleaned, and roasted. The shells of the beans of removed. The remaining part of the cacao bean is known as "cacao nibs." The nibs are ground down and liquified, which creates pure chocolate in liquid form (known as Chocolate Liquor). This liquid can be further broken down into cocoa solids and cocoa butter. Cocoa solids are the nonfat part of the chocolate liquor. It is also known as cocoa powder. The cocoa solids are responsible for giving chocolate its brown color and its chocolate flavor. It is in the cocoa solids where the healthy antioxidants are found. Cocoa butter (also known as Theobroma Oil) is the natural, vegetable fat found in the chocolate liquor. It is ivory in color and has a mild chocolate flavor and aroma. Cocoa butter gives chocolate its smooth texture. Often you see dark chocolate packages labeled with "% Cocoa" (or "% Cacao"). This precentage identifies the amount of cocoa solids present in the chocolate. A higher percentage means more cocoa solids, less sugar, a more intense chocolate flavor. For example, a 75% Cocoa chocolate has less cocoa solids and sugar than a 60% chocolate. The 75% Cocoa chocolate has more chocolate flavor, is sweeter, and is a bit more bitter than the 60% chocolate. Cocoa powder is made by removing the cocoa butter from the cacao bean and grinding the remaining material into a powder. In the U.S., cocoa powder comes in two forms. Natural cocoa powder is often labeled as "unsweetened cocoa powder." It has a red brown color and has a bitter, yet fruity chocolate flavor. Dutch-processed cocoa powder has been treated with an alkali to neutralize its natural acidity. It is darker and has a milder flavor than natural cocoa powder. You can substitute one cocoa powder for another. However, dutch-processed cocoa powder has a high alkaline level. This reacts with baking soda, producing a chemical-like flavor.